Once championed as the answer to chronic pain, opioid medications and painkillers have become a large and costly problem in the United States. Fatal overdoses have quadrupled in the last 15 years, and opioids now causemore deaths than any other drug, over 16,000 in 2010. 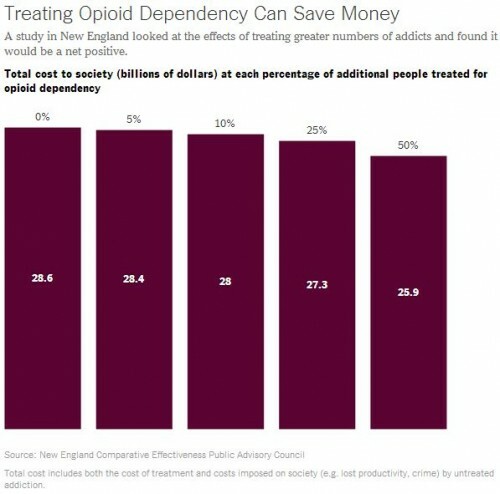 Prescription opioid abuse is also costly, sapping productivity and increasing health care and criminal justice costs to the tune of $55.7 billion in 2007, for example. Such treatment isn’t free, of course, but many studies have shown it’s worth the cost. Just considering health care costs alone, studies have shown it to becost-effective with substantial offsets in reduced spending on other types of health care. For example, methadone treatment limits the spread of H.I.V. by reducing the use and sharing of needles. It also reduces hospitalization and emergency department use, such as treatment of trauma, perhaps from accidents. Considering the broader, social costs of opioid dependence as well — those due to lost productivity and crime — the case that maintenance therapy for opioid dependence is cost saving is even stronger.